Anyone who knows me very well is aware that I’m a major Disney nerd. I love watching Disney movies with my kids, singing the songs to them, or obsessing over trips to Disney theme parks. I find the magic and inspiration that Walt Disney gave the world to be monumental. Walt Disney belongs to the investigator (NT) category of personality types. A lot of people think of NT types as a group of scientists, physicists, or people whose worlds revolve around cold, hard facts. The truth is, there’s a wonder to the NT mind that seeks to explore the unknown and to think outside the box (sometimes through science or physics). Walt Disney was a jack-of-all trades; an artist, a business man, an ambulance driver, and an architect. Walt Disney perfectly demonstrates the imagination, curiosity, and vision of the NT mind, and he can inspire all of us to reach for our goals, even when it seems impossible. ENTPs value inspiration above everything else and follow it into numerous avenues and pathways. They love adventure, exploring, researching, inventing, and creating. ENTPs are insatiably curious and travel from one project to another with optimism, intensity, and tons of imagination. Walt Disney had to fight to follow his inspirations, but he believed in them without fail. He grew up in a poor family and was raised by a father who was known for being a harsh disciplinarian. He had no handouts or special advantages in his life. He had to truly believe in his dreams and his art to keep going. At the age of 7 he sold his paintings and drawings to neighbors to earn extra cash, and at the age of 10 he worked on a railroad selling newspapers and snacks. He loved being aboard trains and absorbing the feeling of adventure and freedom it gave him. 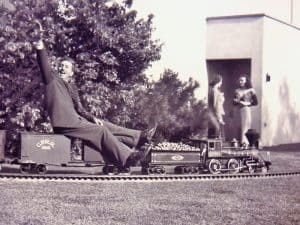 This later inspired him to make his own backyard model train set, and also inspired him to create the railroads that circle both Disneyland and Disney World’s Magic Kingdom. At the age of 16, Disney lied about his age so that he could enlist to join the military during World War I. He was turned down, but eventually he was accepted by the Red Cross where he trained to be an ambulance driver. In true Disney style he covered his ambulance stem to stern with cartoon drawings. Walt Disney faced many obstacles in his life; from money troubles to being ripped off in bad business deals. There was no end to challenges in his life, especially when he was just getting started. When Disney had the inspiration to create a full-length, animated movie, Hollywood agents referred to it as “Disney folly”. Nobody thought it would work. He had to mortgage his first house just to make his first movie a reality. He proved his many critics wrong when Snow White and the Seven Dwarves was released in 1937 and brought in $8 million. (That’s about the same as $134 million today!). ENTPs trust their inspirations, their gut feelings, their visions. Walt Disney wouldn’t let anyone tell him something couldn’t be done. He was tireless in his work and incapable of giving up. Walt Disney could handle criticism and naysayers because deep inside he was always expanding and independently formulating his own logical plans. He was fine with spending exorbitant amounts of time and effort, even money, on his projects because he was always seeking to make them perfect, to make them evolve into exactly what he wanted. This patience and passion to evolve, to experiment, to continually progress is a hallmark of Introverted Thinking types. They care less about putting a completed project out into the world than to learn and expand intensely, always being willing to change directions, to modify their viewpoint, and dig deeper. In true ENTP fashion, Walt Disney loved technology and was always aware of new advancements in technology. 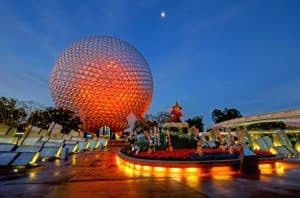 With this love of technology and innovation he imagined EPCOT, an acronym for Experimental Prototype Community of Tomorrow, a utopian city of the future. Walt Disney knew how to reach out and inspire people. He was aware of what motivated others, what made them happy, how to make children and adults alike feel that anything was possible. He was known for his communication skills, people skills, and ability to inspire. He was an excellent salesman, able to win people over quickly and effectively. ENTPs are known for their ability to charm, to easily navigate social situations, and alter the moods in their external environment. Their tertiary extraverted feeling function gives them an awareness of what people want to hear. One day Walt attended a board meeting for a company that he wanted to sponsor his Autopia attraction. He easily convinced the board that it was a great investment and they wrote him large check right on the spot. After Walt shook their hands and walked away, one board member, who had been so drawn to Walt’s love and enthusiasm for the project, said, “I have a question. What did we just buy??”. If you read about Walt’s career you’ll find numerous stories just like this one. ENTPs may have inferior introverted sensing, but it still casts a soft glow on everything they do. Introverted sensing collects facts, remembers details, cherishes the past and learns from it. You can see Walt Disney’s introverted sensing side as soon as you walk down Main Street USA. He wanted this street to resemble the Main Street of his childhood hometown of Marceline, Missouri. Walt Disney had a fondness for history and nostalgia. The cannons that are displayed in the center of the square on main street were used by the French army during the 1800s. The gas lamps that line the street create a timeless, reminiscent feel that echoes from days long past. Walt Disney has always been an inspiration to me. He makes all of us believe that magic can happen, that dreams can come true. He faced seemingly insurmountable odds to achieve his goals, and if he can do those things, why can’t any of us? This is one of the great traits of ENTP personalities and just goes to show how far they can go if they believe in their passions. 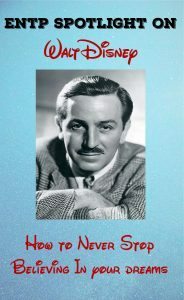 If you want to find out more about Walt Disney, you can read his biography here. actually, I think Walt Disney is ENFP. He displays the sort of sensitive demeanour that the ENTP usually lacks to a degree, and he was primarily focused on adding colour and magic and richness to the world, which is also ENFP-esque. This is one of those typings that is harder to determine. I’ve read some biographies of Walt Disney and I can see aspects of both, especially in mid-life. I do think it’s possible that that is because he was developing tertiary Fe in mid-life. I also know that David Keirsey typed him as ENTP. I can see where ENFP is a possibility, though, I think it is hard to tell when you can’t sit down with someone face to face and figure it out in person. I’m definitely open to the possibility he could be ENFP but I do see a lot of ENTP traits when I read his biographies. Very interesting. Fe/Fi are difficult to determine.